Is the Flooring in Your Home Contributing to Your Sore Feet? Do you wake up in the morning with stiffness in your feet that after a few steps disappears? This is a warning sign that very likely your plantar fascia is tight. The plantar fascia tends to shorten while we are resting. After a few steps in the morning loosens up. Over the last 15-20 years we have gotten away from the thick under padded carpet in our homes. We are instead using harder materials, like ceramic tile, hardwood and laminate flooring. These materials put a lot of strain on our feet as we heel strike. Some of us have heavier heel strikes than others and have feet that are not as able to absorb shock. These people are more susceptible to developing tightness, pain in the plantar fascia. If you have experienced plantar fasciitis in the past, or have the warning signs of sore feet in the morning, a good solution is to wear indoor footwear. The footwear will help the feet absorb shock. We recommend wearing a shoe that you don’t need to grip to hold them on. NO FLIP FLOPS! Wearing a pair running shoes indoors or Crocs with an ankle strap can be helpful. The other thing to think about if renovating is to choose more shock absorbing flooring like cork, or cushioned flooring that looks like ceramic tile. Watch this video on Plantar Fasciitis! 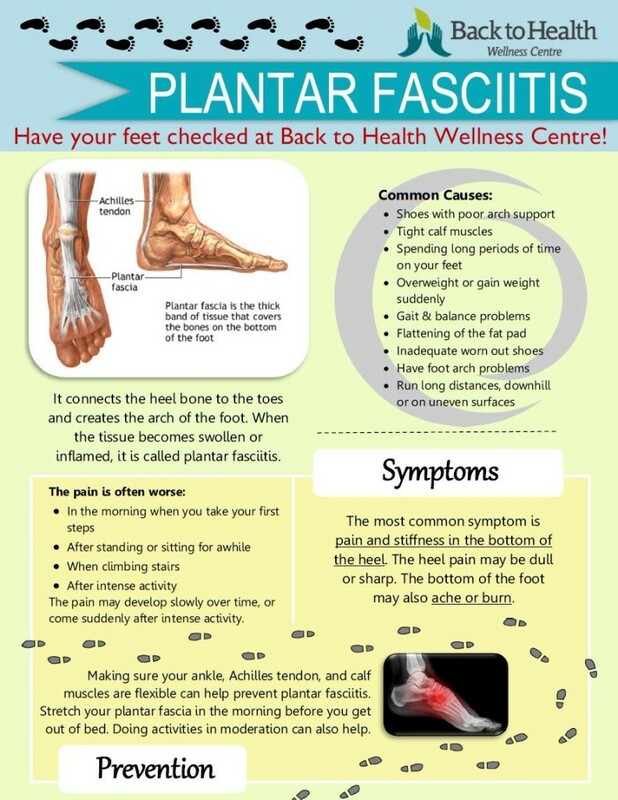 The goals of treatment for plantar fasciitis are to: relieve inflammation and pain in the heel, allow small tears in the plantar fascia ligament to heal, improve strength and flexibility correct foot problems such as excessive pronation so you don’t stress the ligament, and allow you to go back to your normal activities. There are many methods you can try to relieve the heel pain of plantar fasciitis such as: icing, stretching, using an acuball, chiropractic adjustments to the ankle, Active Release Technique, acupuncture, orthotics, and using a night splint. For chiropractic, there is a relationship between the plantar fascia and the ankle joint in that the joint becomes restricted and needs to be adjusted. Adjustments of the joints of the foot is vital as fixated joints will certainly put stress on the local soft tissues. We also often compensate with our knees, hips and lower back thus we should have these areas assessed as well in order to fix the whole problem. The Active Release Technique or ART, provides an excellent treatment approach for the soft tissue that is compromised and/or scar tissue that is residing in the area when you have plantar fasciitis. Orthotics are also a good treatment choice as they help to distribute foot pressure more evenly. It’s important for those with plantar fasciitis to avoid irritating activities, and allow the fascia to rest until pain subsides. Icing the area after use can also help reduce pain and swelling. As well a new stretching technique has proven effective at reducing the pain of plantar fasciitis when performed several times a day. It is performed by crossing one leg over the other and pulling the toes toward the shin for a count of ten and repeating ten times. This is a change from the standard treatment that recommends the weight-bearing stretches. For specific plantar fasciitis stretches, follow this link! As well, research has proven acupuncture to be successful at reducing the pain and inflammation of plantar fasciitis. 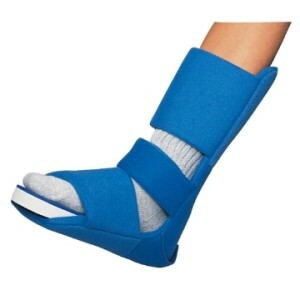 Night splints usually are designed to keep a person’s ankle in a neutral position overnight. Most individuals naturally sleep with the feet plantar-flexed (bent down), a position that causes the plantar fascia to be in a foreshortened position. A night dorsiflexion (bent up) splint allows passive stretching of the calf and the plantar fascia during sleep. Theoretically, it also allows any healing to take place while the plantar fascia is in an elongated position, thus creating less tension with the first step in the morning. Several studies have shown that use of night splints has resulted in improvement in approximately 80 percent of patients using night splints. Night splints were cited as the best treatment by approximately one third of the patients with plantar fasciitis who tried them. Questions? Ask Dr. Barbara Rodwin and feel free to check out the night splint on display in front reception!